U.S. Rep. Donald Norcross won the Democratic primary in New Jersey's First Congressional District on Tuesday. All 12 U.S. House of Representatives seats were on the ballot Tuesday in New Jersey and 11 incumbent candidates secured reelection. As of 11:40 p.m., 11 races were decisively called in favor of the incumbent nominees. But one race between Republican incumbent Scott Garrett and Democratic challenger Josh Gottheimer in the 5th Congressional District had yet to be determined. Gottheimer prevailed to prevent a clean sweep from the incumbents. 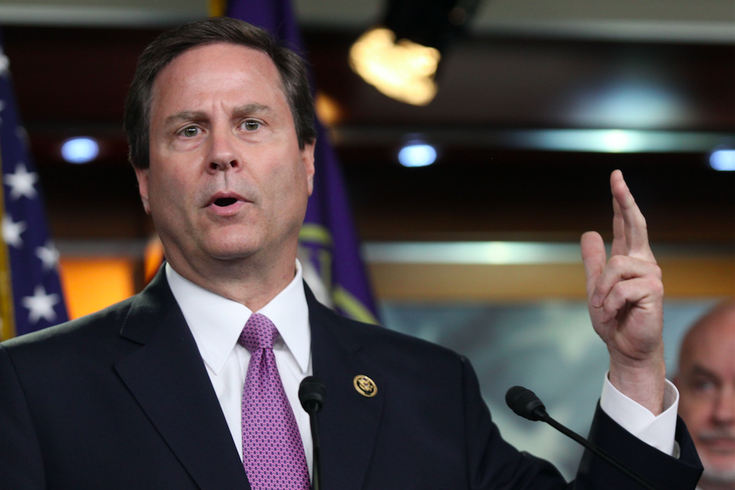 Democratic U.S. Rep. Donald Norcross secured his election bid against Republican Bob Patterson. Norcross outpaced Patterson, 126,431 votes to 81,137, with 79 percent the vote counted. No third-party candidate gained more than two percent of the vote. They were Scot John Tomaszewsi of the We Deserve Better party, William F. Sihr IV of the Libertarian Party and Michael Berman of the AmericanIndependents.org. Norcross assumed office in November 2014 after U.S. Rep. Rob Andrews resigned. The 1st Congressional District includes 52 municipalities in Burlington, Camden and Gloucester counties. U.S. Rep. Frank LoBiondo will serve an 11th term in Washington after defeating Democrat David Cole. LoBiondo knocked off Cole, 122,039 votes to 78,274, with 68 percent of the vote counted. Third-party nominees Steven Fenichel of the Representing the 99% Party, Gabriel Brian Franco of the For Political Revolution Party, James Keenan of the Make Government Work Party and John Ordille of the Libertarian Party did not get more than one percent of the vote. In the 2nd Congressional District includes 92 municipalities in Atlantic, Burlington, Camden, Cape May, Cumberland, Gloucester, Ocean and Salem counties. After running unopposed in the June primary, U.S. Rep. Tom MacArthur secured a second term in Washington. MacArthur defeated Democratic challenger Frederick John Lavergne, 144,730 votes to 82,761 with 73 percent of the vote recorded. Lawrence W. Berlinski Jr. of the Constitution Party received two percent. The 3rd Congressional District includes 52 municipalities in Burlington and Ocean counties. U.S. Rep. Chris Smith earned a 19th term representing the 4th Congressional District, which incorporates 40 municipalities in Burlington, Mercer, Monmouth and Ocean counties. Smith received 64 percent of the vote to defeat Democratic challenger Lorna Phillipson with 78 percent of the vote reported. Jeremy Marcus of the Libertarian Party and Hank Schroeder of the Economic Growth Party were also on the ballot. Neither garnered more than two percent of the vote. U.S. Rep. Scott Garrett was ousted from his seat by voters in the 5th Congressional District, which incorporates 79 North Jersey municipalities in Bergen, Passaic, Sussex and Warren counties. With 100 percent of the vote counted, Democratic challenger Josh Gottheimer narrowly defeated Garrett, 156,082 votes to 145,816, to secure the seat. Libertarian Party candidate Claudio Belusic received two percent of the vote. U.S. Rep. Frank Pallone earned a 15th full term in the U.S. House of Representatives after defeating Republican challenger Brent Sonnek-Schmelz. Pallone received 64 percent - 129,723 votes - over Sonnek-Schmelz's 69,450 with 90 percent of the vote counted. Third-party candidates Rajit Malliah of the Green Party and Judith Shamy of the Libertarian Party could not crack one percent of the vote. The Sixth Congressional District incorporates 32 North Jersey municipalities in Middlesex and Monmouth counties. In the 7th Congressional District, which incorporates 54 North Jersey municipalities in Essex, Hunterdon, Morris, Somerset, Union and Warren counties, Republican incumbent Leonard Lance is opposed by Democrat Peter Jacob. Third-party candidates Arthur Haussman Jr. of the Conservative Party and Dan O'Neill of the Libertarian Party are also on the ballot. U.S. Rep. Leonard Lance was reelected after defeating Democrat Peter Jacob. With 92 percent of the vote reported, Lance beat Jacob with 123,740 votes to 94,007. Dan O'Neill of the Libertarian Party received two percent of the vote while Arthur Haussman Jr. of the Conservative Party got one percent. Lance, a Republican, assumed office in 2009 to represent the 7th Congressional District, which incorporates 54 North Jersey municipalities in Essex, Hunterdon, Morris, Somerset, Union and Warren counties. Democratic incumbent Albio Sires was successful in his first bid for reelection. With 38 percent of the vote counted, Sires knocked off Republican Agha Khan, 40,908 votes to 8,418. Pablo Olivera of the Wake Up America Party took three percent of the vote while Dan Delaney of the Libertarian Party only received 1 percent. The 8th Congressional District consists of 15 North Jersey municipalities in Bergen, Essex, Hudson and Union counties. U.S. Rep. Bill Pascrell Jr. fended off a challenge from Republican Hector Castillo for another full term in the 9th Congressional District, which incorporates 35 North Jersey municipalities in Bergen, Hudson and Passaic counties. Pascrell received 98,224 votes to Castillo's 48,839 with 66 percent of the votes counted. Third-party candidates Diego Rivera of the Libertarian Party and Jeff Boss of the NSA DID 911 Party did not crack one percent. U.S. Rep. Donald Payne Jr. secured a second full term by beating Republican challenger David Pinckney. With 74 percent of the vote counted, Payne garnered 140,472 votes to Pinckney's 18,374. Aaron Walter Fraser of the New Beginnings party and Joanne Miller of the Women of Power Party did not receive more than one percent. Republican incumbent Rodney Frelinghuysen has earned an 11th full term in the U.S. House of Representatives with a win over Democrat Joseph Wenzel. With 92 percent of the vote recorded, Frelinghuysen beat Wenzel, 164,873 votes to 107,640. Third-party candidates Thomas DePasquale of the Financial Independence Party and Jeff Hetrick of the Libertarian Party also received approximately two percent of the vote. The 11th Congressional District incorporates 54 North Jersey municipalities in Essex, Morris, Passaic and Sussex counties. U.S. Rep. Bonnie Watson Coleman has a earned a second full term in Washington after a successful bid reelection against Republican Steven Uccio. With 90 percent of the vote in, Coleman received 122,431 votes to Uccio's 71,642. Third-party nominees Michael Bollentin of the We the People Party, Thomas Fitzpatrick at the Libertarian Party and R. Edward Forchion of the Legalize Marijuana Party, Robert Shapiro of the Teddy Roosevelt Progressive Party and Steven Welzer of the Green Party were also on the ballot. None of those candidates garnered more than two percent of the vote. The 12th Congressional District consists of 31 municipalities in Mercer, Middlesex, Somerset and Union counties. Full disclosure: U.S. Rep. Donald Norcross is the uncle of PhillyVoice.com Executive Director Lexie Norcross.